Our premium basket is delivered brim-full with delightfully fresh fruit, flavorful sausage, as well as a selection of cheeses and crackers. We also tuck in a sweet chocolate treat to round out the selection. You may choose either one or two bottles of Chardonnay or Merlot to complete your gift. Each basket includes regional gourmet specialties and wines to make them truly unique. The Premium Selection is a hand delivered gift. These gifts are delivered by one of our local design centers located throughout the United States and Canada. Same day delivery is available for most gifts when ordered before the cutoff time. The cutoff time for The Premium Selection is 1 PM in the recipient's time zone. A great big huge amazing beautiful basket!! Was a gift for my moms birthday and she said it was exceptional, which almost never happens when I order something. She said all of the fruit was fresh and the basket was over loaded. Thanks so much! I ordered the premium basket which included 2 bottles of wine. My friend was delighted with this gift! I did not get to see the "Get Well Gift" but she told me it was one of the nicest she has seen. The basket was filled with fruits and treats as I expected, and made a beautiful presentation. This was given as a token of my appreciation for some dear friends that have helped my family out on many occasions. Great job! I would use the Gift Tree again. We sent this to my brother and sister-in-law for their 40th Anniversary. They were speechless when they received it! A perfect gift when you're not sure what to send. Had a little bit of everything to help them celebrate! Everyone that saw this basket said it was beautiful. I never get to see the gift baskets that I send (because I live in New Zealand), so would not know what they are like. But the recipients are always pleased with the product, so that's the main thing! AND what's more...they always arrive on time! Great! Selection arrived promptly, the day after ordering, The recipient was very pleased with the bountiful assortment that included fruits, condiments, crackers, cheese and wine. The customer service rep was VERY helpful in assisting me in making a selection as well as helpful in creating just the right sentiment for the card. I am very pleased with the vendor, would recommend to others and would use again. I ordered this impressive gift basket for my daughter's 33rd birthday and she loved it! 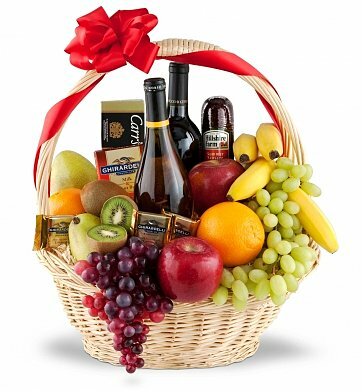 It was full of super fresh fruit, a great bottle of wine and lots of other quality goodies to her delight. She called and could not stop talking about it. I highly recommend this basket. I've used gifttree.com in the past and have never been disappointed. Thank you!! Gift Tree produced the reaction I desire! My Father loved his birthday basket! Thank you for a job well done, I will DEFINITELY use your services again! It was my older sisters 55th birthday and I wanted to get her something special since I would not be able to spend the day with her. I selected the wine because it matched her personality. The excitement in her voice as she describes the basket was priceless. Thank you so much for making my sisters birthday special. My son and daughter-in-law were very excited to receive this awesome(that's how they described it) basket of goodies. Everything was perfect and beautifully arranged. My family was in Oklahoma City recently and some old college friends entertained us every day. I wanted to send them some wine to show our appreciation of their hospitality; however, state law prohibits shipping wine. This was a fantastic solution as it was hand delivered to their door. I got a voicemail from my friend raving about how gorgeous and huge the package was. They were very happy, which of course, made us very happy. Thank you! Although I did not see the basket, my Aunt was blown away when the Basket arrived. She could not believe how loaded the basket was. She said it was almost too heavy for her to carry. I know she really liked it because she mentioned it to both Cousins! recipient was thrilled to recieve such an amazing variety basket. Sent this to a couple as a "Thank You". They called me immediately and were thrilled with the presentation. The wife kept screaming "Are you kidding me, are you kidding me!" She was already munching on some of the treats and the entire family was in the background excited about the size, presentation and contents of the basket. I have not heard about the quality of the wine, so for that reason I can only give 4 stars. I am hoping that they were good quality for the price because the husband is actually somewhat of a connoissuer. Process was quick and easy. From ordering to delivery between states took about 4-5 hours.